Every Sunday morning at precisely 11:00, a bell can be heard ringing across the little community of Fountain Green. It is the call to worship by the pastor of the Fountain Green Presbyterian Church, Rev. Mark Hanson. On a clear day, the bell can be heard by many across Fountain Green Township (population 329). After the call to worship, the lighting of the Advent candles is presented by members of the church. Advent is celebrated by Christians on each of the four Sundays prior to Christmas in an act of preparation and anticipation for the birth of God's son Jesus. On December 13th, Betty Jo McConnell and her three sisters lit the candle and gave the scripture and reading for the 3rd Sunday of Advent leaving 3 violet candles burning around the evergreen and red holly wreath. A rose candle was lit at the 4th reading this past Sunday and the central white candle, or the Christ candle, was lit on Christmas Eve at their 5:00 p.m. service. Many families gathered at this special celebration of Christ's birth. Earlier, on December 6th, a guest minister spoke, Steve Miller of the Carthage radio station, who is an affiliate of Moody Bible out of Chicago. His message was on "the love of Christmas" describing the reason for Christmas and why Christ came-because of love. Miller said Christ's love is described in John 3:16 but Miller said, "Let us read the commandment of Jesus written in the Bible in John 13:34-35." "A new commandment I give to you that you love one another as I have loved you, that you also love one another. By this, all will know that you are my disciples if you have love one for another." Miller gave examples describing how Jesus loved others. He said Jesus washed the disciples' feet. Jesus wanted his disciples to understand his purpose was more than "teacher" and "Lord," but he came to serve. "You are also to wash one another's feet," Jesus said. I have given you an example." Miller said that we are to love one another by serving others and doing for each other even something you may not want to do. Washing feet was given to the lowest people in the house. Jesus loved them so much that he served in this manner. This is how you love one another. This is the heart attitude of Christ, to be kindly and affectionate to one another, giving love in action. "Stomping over one another at the stores to get the best bargain is not showing brotherly love," Miller said. "But, doing such things as letting someone go ahead of you in line that only has a few things is. You show love for the people around you with a kind-hearted mind-set." When the disciples were arguing who would be first in heaven, God told them if you really want to be first, you need to put yourself last. Galations 6:2 "Bear ye one another's burdens, and so fulfil the law of Christ." Create a good deed and you may encourage that in others. "Paying it forward isn't something new," he said. "It's God's idea." In 1 Peter 4:8, we are told: "Above all, keep fervent in your love for one another, because love covers a multitude of sins." When you really love someone, you forgive them and go on. When you love someone, you are steadfast. When you get your feelings hurt and you are feeling bad and you don't love them any more, you need to ask yourself why you don't forgive them. God has forgiven you and others of much greater sins. Patience makes such a difference in our love, especially this time of year when everyone is trying to find the perfect gift and are pushing in line. Keep that gentle spirit and make sure you care about other people, giving them privilege. Paul said that because they thought if they were saved, they could do whatever they wanted, but our actions need to reflect a Christ attitude. Loving others is sometimes very hard. We need to check our attitudes. If we are having a hard time loving others than we need to examine our hearts. Miller explained that God loved us despite who we are. "We need to learn that too. Where do we have the right to hate our fellow man? If you know God you will love, because God is love," he said. 6 "We are from God, and whoever knows God listens to us; but whoever is not from God does not listen to us. This is how we recognize the Spirit of truth and the spirit of falsehood. 11 Dear friends, since God so loved us, we also ought to love one another." God demonstrated how much he loves us. John 3:16. "For God so loved the world, that He gave his only begotten son, that whosoever believeth in Him shall not perish, but have everlasting life." Colossians 3:12 "Therefore, as God's chosen people, holy and dearly loved, clothe yourselves with compassion, kindness, humility, gentleness and patience." Seek to know him more and keep focused on Jesus. He will help our minds and heart to be changed. Do you know Him? To know Jesus is to love. Miller likened it to a good shepherd which the much loved 23 Psalms describes so well. 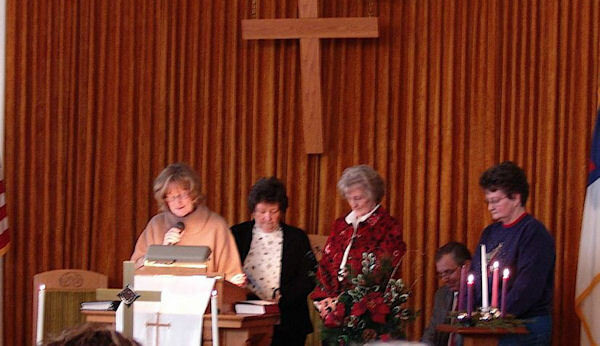 Throughout the church service, Peggy Latherow accompanied the congregation in singing various Christmas songs. On December 13th, Pastor Mark Hanson returned to the pulpit. He fielded joys and concerns of the congregation and prayers were given before the regular church offering was taken up by two youth, Alex Ourth and Landon McKeown. The offering helps support the church and its various missions. Church groups help with local mission work such as Kemmer Village near Springfield where they take bedding, toothbrushes and various items of need. The church also supports mission work of the Presbyterian churches across the nation as a whole. Betty Jo McConnell gathered the children up front by the Christmas tree for a Sunday morning children's mini sermon telling them to be thankful for the many things they have and to give to others. She gathered them in a huddle and whispered a secret and when she said the word, they all turned and gave big smiles to the congregation. She asked them what happened when they did that? "They smiled back," one child said. "Yes," she said. It is in the giving that you receive and it makes others feel good. She asked them to look for ways they could give to others, and help around their homes, especially at Christmas time. On the 13th, Betty Jo gave each of the children a gift of a candy cane and told them the meaning of the red and white color and the shape of the shepherd's hook. Also, the letter "J" is for Jesus. They closed with prayer ending with the Lord's Prayer in unison. On that Sunday, Pastor Mark Hanson's message was "Messages: Missed or Received?" Pastor Hanson said that we receive messages on our phone but we sometimes ignore them, and fail to respond and the message is really useless. We may get the messages but do we react? Do we take heart? Do we take time to understand and to reply? What is the message of Christmas? Yes, the bell rings each Sunday morning at the Fountain Green church at 11:00 a.m.. The message is given. Did you receive the message? Is it a Missed call still waiting on you to respond? Hanson's sermon on the meaning of Christ's birth and what we are doing about it comes clear in his sermon: "The Message, Missed or Received?" 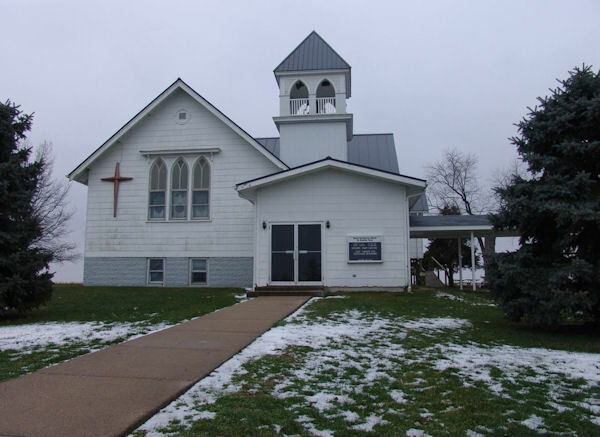 The Fountain Green Presbyterian Church is situated at the edge of the little community called Fountain Green, 5.2 miles south of La Harpe and 11.4 miles from Carthage (the county seat). It is located in Fountain Green Township, one of twenty-five townships in Hancock County, Illinois, USA. The church was formed November 27, 1840 about three years after the town of Fountain Green was organized. A small group of members from a Presbyterian Church in Path Valley, Pennsylvania met with Rev. William A. Stewart of Macomb at the school house in the village of Fountain Green, "a wilderness community. Some had been members of the community for three years, others less," but all felt a need for the church. There were 37 initial members with last names of Geddes, McConnell, Glass, Leal, Foy, McClaughry, Spangler,Galloway, Connell, Lawson, Curry, Witherow, Miller, Ervin, Walker, Blair and Tyler with the first minister coming June 12, 1852, Rev. Thomas M. Walker. Forty-four ministers are listed as pastors or moderators through 1973 in a 1976 history book printed by the church for its 136 years and the nation's Bicentennial. Others have come to lead the church since that time, with the present pastor today being a farmer from Hamilton, Mark Hanson now in his tenth year. He had pastored as a pulpit supply since the mid-80's before coming as their full time pastor. In the beginning years, a private school was opened for two or three years, but closed due to a change in governing laws by the General Assembly. Pew rental at the church was charged each year according to church records. Members were assigned a pew at a price according to the size of their family. A new church building was built in 1872 where the present church stands. It was a large two story building with class rooms, kitchen and dining room on the first floor. The sanctuary had stained glass windows which were saved and are now in the present building. The church has several events, the largest still ongoing is the annual ice cream social of homemade ice cream. In 1976, over 800 attended and 125 gallons of ice cream were made with the men operating the freezers and preparing the church grounds with tents. The annual social is always the first Wednesday in August. The church enjoys a Christmas Eve service with chimes, Maundy Thursday services and Easter services and they call special prayer services throughout the year. Prior to the ringing of the bell, a Sunday school hour takes place for six different classes of the church with the newest one for the adults with Brenda Palmer teaching. There is no official youth group at present, but youth and families do gather for activities throughout the year with roller skating, game night at the church, trips to hockey games and to the Burlington Bees games etc. Also projects of rugs and quilts are handmade and donated or taken to local places as a mission project. There's a Smorgasbord in the Spring and a fund raiser for the church called God's Portion the 3rd Saturday in November where they feed the community and a lot of deer hunters. It includes a meal and an auction. The church has an active 72 membership. Next year in 2010 will be the 170th year of the church as it steadily serves the community. The message has been the same - "Christ is the answer," and witnessing their faith by "word, deed, and example." Betty Jo McConnell gives the Advent prayer. Her three sisters assisted at the Fountain Green Presbyterian Church Dec. 13.